Aston Martin on your iPhone | What Car? Aston Martin has launched an all-new iPhone application (app), with exclusive travel guides and advanced filming and telemetry technology. The Aston Martin 'Experience' app uses the iPhone's built in motion sensors to power the telemetry technology that allows drivers to record forces acting on, and around the car, and how stable it is while driving. 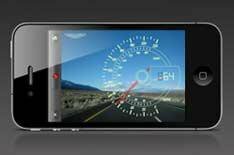 Users can also use the app to film their journey, while an integrated speedometer measures the car's speed. The speedometer uses the GPS hardware to measure speed, with a faithful reproduction of the Aston Martin dials to display the data. There's even a function to measure your car's 0-60mph time. The app's Top Roads feature provides locations and guides to some of the world's best driving roads and circuits. Using the iPhone's built in GPS technology, users are able to check-in to locations and share experiences online. Users of the app are also kept up to date with the latest news and offers from Aston Martin. The Aston Martin Experience app is available from iTunes now priced at 3.49. Find the Aston Martin 'Experience' iPhone app [**here.